Say thank you with a Mother's Day High Tea! 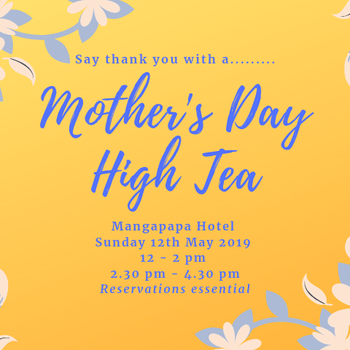 Mangapapa Hotel is offering a beautiful decadent high tea for Mother's Day. It is $55 per person including glass of bubbles or non alcoholic grape juice, plus tea or coffee and a special gift for all the mums. Reservations are essential. Call our team on (06) 878 3234 or email luxury@mangapapa.co.nz to make a reservation. Dietary requirements can be catered for if known in advance. Mother's Day High Tea Say thank you with a Mother's Day High Tea!